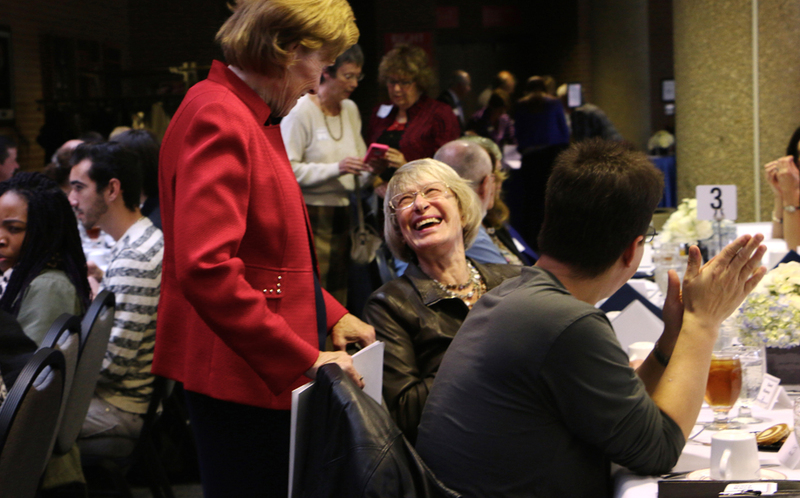 If you were to walk through the Sangamon Auditorium Lobby this past fall on Wednesday, October 28, you may have had to hold your breath to fit between the crowded tables. 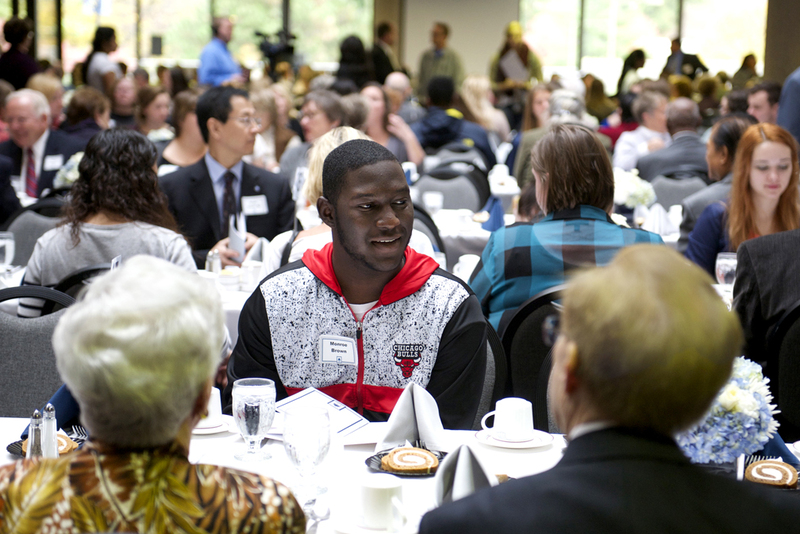 At the Scholarship Luncheon, donors have a chance to meet the students who have received their scholarships. 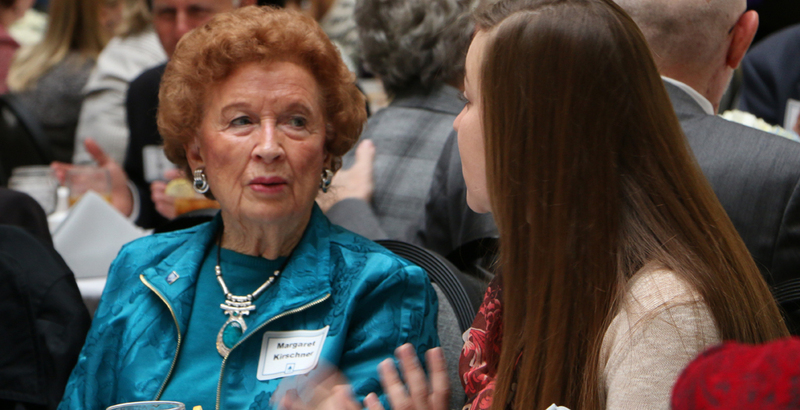 Around the Office of Advancement, we call it “our most beloved event” because it is so gratifying for us to watch donors meet, face-to-face, the person who is benefitting from their gift and to see the gratitude in students’ eyes. one for the new pre-nursing program at UIS. You’ve probably heard that UIS has partnered with the University of Illinois at Chicago College of Nursing to bring a nursing program to UIS. But perhaps you do not know that UIS offered a nursing program in the past, from Fall 1973 to Fall 1999. Elizabeth Denniss is one of our most illustrious nursing graduates from that earlier time. After earning an LPN from a school in Michigan and an RN from Lincoln Land, Elizabeth earned a Bachelor of Science in Nursing (BSN) from UIS (then Sangamon State) in 1985. She then earned two master’s degrees from U of I Chicago’s nursing program in Peoria and became (along with another nurse, Sandy Hudgins-Brewer) Springfield’s first Family Nurse Practitioner. Elizabeth later taught basic clinical skills at the SIU medical school. She has retired now from working in the Emergency Department at St. John’s Hospital as a Family Nurse Practitioner with Emergency Consultants, Inc. I mentioned the Dennisses’ two bequests. Bequests are among the most important charitable gifts that donors can make, a wonderful way to make philanthropic wishes come true, and I know Elizabeth and Herb enjoy thinking about the legacy they will have at UIS. However…a bequest does not allow donors to see the result of their gift. So, as many other donors have before them, Elizabeth and Herb also gave a current-use scholarship—a scholarship that is given right now to a recipient they can meet. 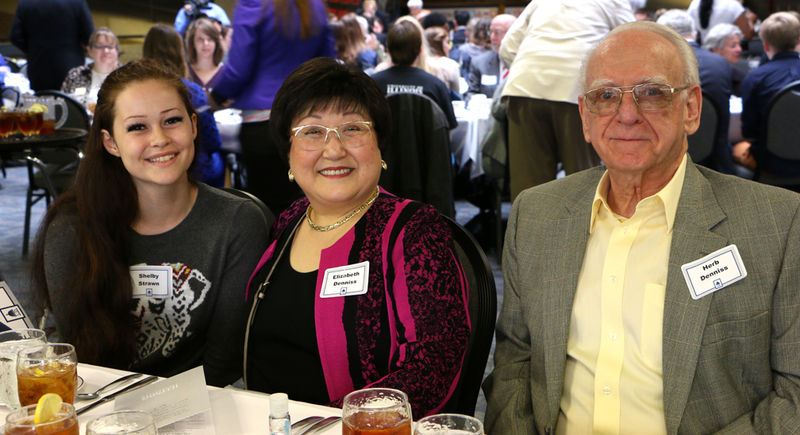 Elizabeth and Herb enjoyed their first Scholarship Luncheon immensely, especially meeting Shelby Strawn, their student recipient. “Our student is quite lovely,” Elizabeth says. Here’s her picture with the Dennisses. Shelby is a Springfield resident who is just starting out on her nursing degree. Shelby’s grandmother, who has had a big role in her life, is a nurse, and Shelby has always admired her. Shelby is paying her own way through college, using savings and financial aid. She recently had to take out her first loan, so she is extremely grateful for the Dennisses’ scholarship. Elizabeth’s first piece of advice as Shelby’s mentor? That Shelby take her time deciding on what kind of nursing to focus on. The friendship that began at the Scholarship Luncheon will not end there. Shelby sent Elizabeth and Herb a card after the luncheon, and Elizabeth sent Shelby one of her hand-crafted cards: “It was beautiful,” Shelby says. They have also exchanged phone numbers and have texted each other. 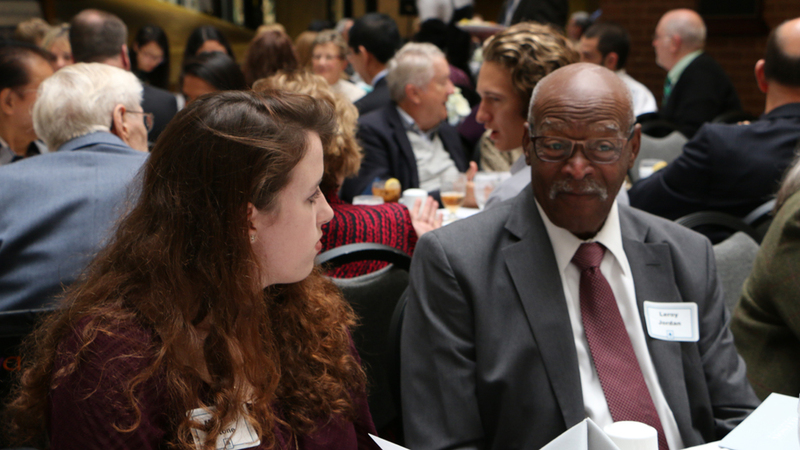 Special relationships like this are another reason why we consider the Scholarship Luncheon such a “beloved” event. Donors and students, I hope you will all be able to come next fall!